Last January, I made several resolutions that I hoped to fulfil through the course of the year. A flood in my apartment, which led to several walls being torn out and weeks and weeks of workmen Humpty Dumpty-ing my home back together again killed any drive I had to enact the “entertain at least once a month” resolution. Or any of the myriad food-related resolutions I had, since my kitchen was barely navigable from all the belongings normally hidden away in the storage room. And so, in the end, I fulfilled none. And so far, I’m off to an unexpectedly good start. 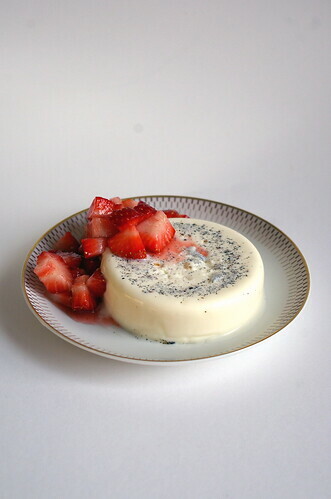 I’m partway through Jane Austen’s Northanger Abbey and have Wuthering Heights by Emily Bronte on standby; I’ll be travelling to Morocco this fall; and I made panna cotta. 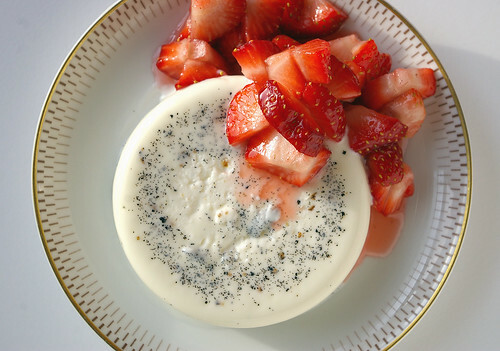 Panna cotta – literally “cooked cream” in Italian – is nothing more than sweetened cream (or a combination of cream, milk, buttermilk or yogurt) infused with any one of myriad flavours. It’s infinitely adaptable; I’ve had everything from simple vanilla versions to ones flavoured with orange blossom water, topped with fruits or coulis or left unadorned to let the light flavour come through. It’s silky, soothingly smooth and can be the perfect end to most meals. And it is ridiculously easy. The hardest part of making this recipe was wading through the hundreds of versions that popped up after a straightforward Google search. But, for the first time attempting it at home, I wanted something uncomplicated. Nothing more than cream, vanilla, sugar and gelatin, topped with a few macerated strawberries for colour and flavour. This version from food blogger and author David Lebovitz fit the bill. Even making the panna cotta felt soothing: from scraping out the fragrant flecks of vanilla from their pods and stirring them into the cream that was gently heating on the stove, to pouring the liquid into ramekins and putting them to bed in the fridge for the night. But any frustrations stemming from their unwillingness to slide out on the first attempt evaporated with the first bite of panna cotta. Sweet, light, brightened by diced strawberry and speckled with vanilla, it was everything I had hoped for. If the rest of my resolutions turn out to be this easy, I just might get through all of them this year. This version is slightly adapted from David Lebovitz – namely the addition of macerated strawberries – who in turn adapted it from Judy Witts’s Secrets From My Tuscan Kitchen. You can find gelatin, which is typically sold in boxes of packets, in the baking section of most grocery stores. Heat the cream and sugar in a pot on the stove or in the microwave until the sugar is dissolved. Remove from the heat. 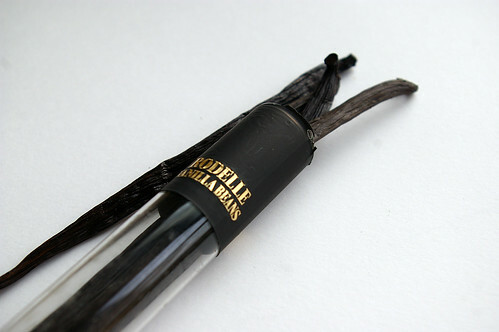 Scrape the seeds from the vanilla bean and add them and the pod to the cream. Cover and let infuse for 30 minutes. Remove the pod and rewarm the mixture before continuing. 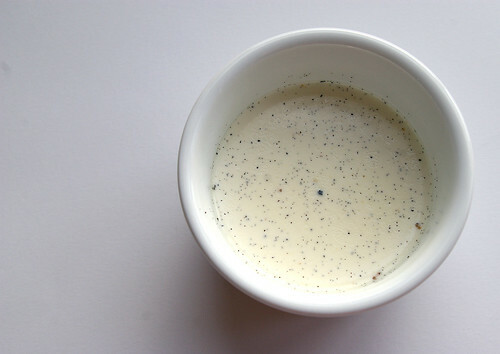 Lightly oil eight custard cups with a neutral-tasting oil, such as vegetable or safflower. In a medium-sized bowl, sprinkle the gelatin over the cold water and let stand 5 to 10 minutes. Pour the warm panna cotta mixture over the gelatin and stir until the gelatin is completely dissolved. Divide between the prepared cups, then chill until firm (at least two hours). 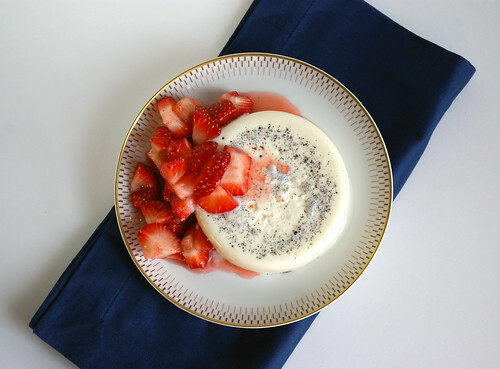 Just before serving, mix together diced strawberries and sugar and let sit while unmolding the panna cotta. To serve, run a sharp knife around the edge of each panna cotta and dip the ramekin in a dish of hot water to loosen. Unmould onto a serving plate and top with strawberry mixture. This first appeared in the Calgary Herald. For more recipe ideas and food stories, check out the Herald’s food page. I suppose my scone anxiety started about 10 years ago when I was doing a stint teaching English in Japan. My next-door neighbour invited me to a cooking class being hosted by one of the American wives who lived on a nearby U. S. naval base. Every so often they would run these courses and local housewives in my small town would sign up, looking for a chance to learn some foreign cooking and perhaps practise English. I’m sure I paid attention. I’m also sure we put in all the ingredients. I’m confident we didn’t overmix. But pulling our tray from the oven, it was painfully obvious something, somewhere had gone wrong. The navy wife clucked her tongue and kindly suggested we forgot to add the baking powder. To say they were hockey pucks would have been polite. To add to that anxiety was the confusion I suffered when attempting to make scones again: how best to mix the butter with the flour to ensure even incorporation while the butter remains cold. Pastry blender? Fingertips? Food processor? It was all a bit much for this would-be perfectionist to handle. I understood the logic behind it. If the butter stays cold and is perfectly mixed in with the rest of the ingredients, it will melt in the heat of the oven, creating light layers in the scone. But I just didn’t know which method was best. Still, one can only be afraid of scones for so long. And if those two things aren’t enough to make this girl face down her anxiety with a round of strawberry shortcakes, I’m not sure what would be. 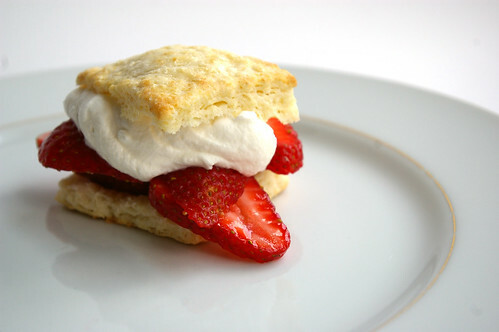 After all, the thought of a light, golden scone-like shortcake, topped with slightly sweetened strawberries and a healthy dollop of whipped cream is enough to make me do things much worse than attempt a recipe while bracing for failure. As hoped for, my anxiety completely melted away when the recipe came together quickly and the shortcakes out of the oven were the requisite golden colour, pulling apart neatly to display all their lovely inner layers. It may have been thanks to chef Nigella Lawson’s approach to the butter conundrum, which is to grate frozen butter into the dry ingredients. It seems so ridiculously smart, now that I think about it. After all, if the goal is even distribution, what better tool to use than something that will conveniently portion the butter out into tiny pieces? Not to mention the fact that because the butter is frozen, it’s difficult for it to warm up too much before the mixture goes into the oven anyway. It may also have been that I made absolutely sure to add the leavening. And it may have been that sometimes anxieties just need to be confronted. After all, the rewards to be reaped here will carry on and on. 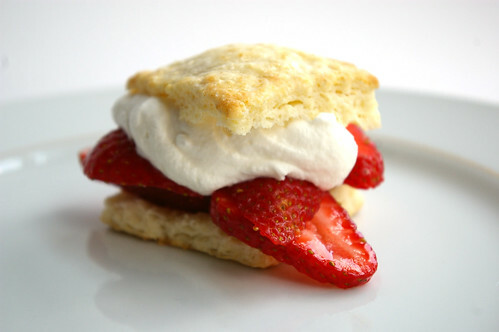 And, in the immediate moment, there are shortcakes to enjoy. Adapted slightly from chef Nigella Lawson’s How to Be a Domestic Goddess. 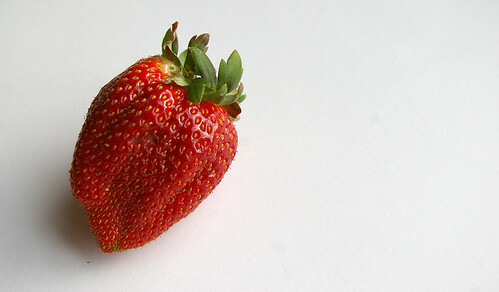 mix the sliced strawberries with 1 tbsp (15 ml) sugar and set aside in the fridge. Turn the dough out onto a lightly floured surface, then roll gently to about ¾-inch (2 centimetres) thick. 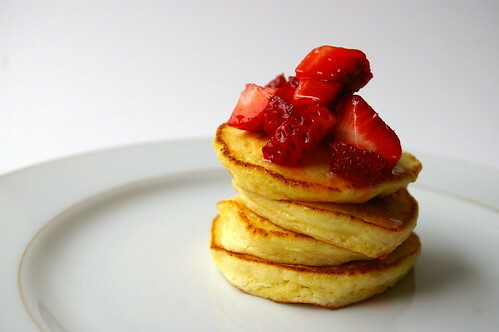 Dip a cutter in flour and cut out as many shortcakes as possible. Work the scraps back together, re-roll and cut more. (Nigella suggests using a 3-inch/6½-cm round cutter to make 8; I used a much smaller square one and subsequently got 15 shortcakes.) Place on a baking sheet, brush the tops with the 2 tbsp (25 ml)whipping cream and sprinkle with the remaining sugar. Bake for 10 to 15 minutes (because mine were significantly smaller than suggested, they only took 8 minutes) until golden. Remove to wire rack to cool. Whip the whipping cream with the remaining 1 tbsp (15 ml) sugar-and a splash of vanilla extract if desired. Split the shortcakes through the middle, top with a spoonful of strawberries and dollop of whipped cream and then put the top back on. These are best served slightly warm. I’m not a big breakfast eater. Don’t get me wrong, I do eat breakfast. But these days it’s usually a bagel at my desk or a scone picked up on my way to work because, frankly, I’d rather have those extra 10 minutes of sleep than a sit-down morning meal. Unsurprisingly, I’m not much of a morning person. Brunch, I like. Breakfast-type meals, but after a good sleep-in. Growing up, when I was a bit better about waking up in time to eat before leaving the house — partly because it was trickier to eat and walk to school at the same time — I had the strange habit of preferring to eat leftovers for breakfast. Pasta and tomato sauce? Yes, please. Mashed potatoes with gravy? Warm and filling. Cold pizza? Breakfast of champions — after all, it does have several major food groups. My parents thought it was amusing. Except for the day I wanted to make fish sticks for breakfast; my mom drew the line at that. But sometimes I do want a real breakfast. At home. In my pyjamas. What I don’t want, though, is a basic pancake. 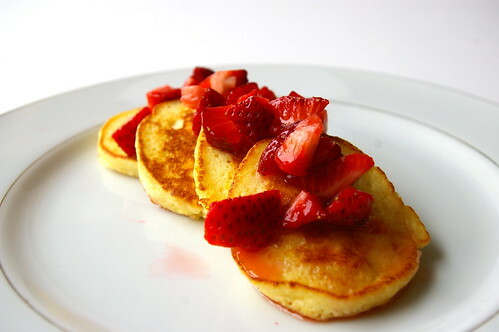 My Internet travels provided a solution, as I came across a recipe for lemon ricotta pancakes — an intriguing idea. And what a pleasant surprise this recipe turned out to be. Not only did they combine my love of all things lemon, but they were light, like flat baby souffles, with golden edges and a hint of salt from the melted butter they were fried in. I shamelessly scarfed a bunch down as, ahem, quality control before handing a plate to a friend I had staying with me. In my defence, I had made them quite tiny. So fluffy and weightless, so bright with their lemon flavour. I couldn’t get enough. But this recipe wasn’t without its foibles. Confusingly, the tubs of ricotta are measured in grams and not millilitres or cups. I did some math and the 250-gram tub was a little more than one cup. I wasn’t going to hang on to a tablespoon or two of ricotta cheese, so I just dumped the whole thing in. Surely, I figured, it wasn’t going to do much harm. And it didn’t. Plus, it’s one of my huge pet peeves to have a recipe that calls for almost an entire can/jar/tub or something, leaving us cooks with random leftover ingredients. Also, I couldn’t be bothered to zest the lemon onto something just to put it in a measuring spoon and then add it the mixture, so I just zested one lemon straight into the egg yolks. I might be tempted to try the zest of two lemons next time, but only because I love that flavour and feel there’s no such thing as too much lemon. Lastly, the original recipe I found for this suggested mixing raspberry jam with maple syrup as a topping. But I wanted something that was going to complement the light lemon flavour of the pancakes, rather than weighing it down. Just before I got started, I diced up about two cups of strawberries, sprinkled on some sugar and let them sit to macerate while I got down to business. It was the perfect pairing. 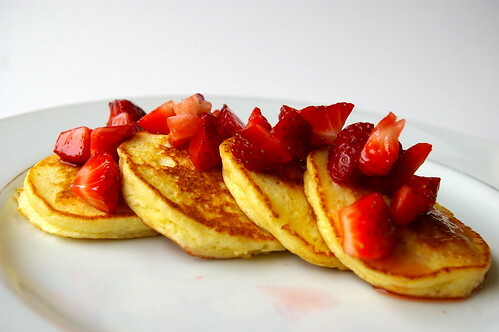 The slightly sweetened berries added the right touch of fruit, but still let the pancakes shine. This recipe is adapted from the Alberta Egg Producers. In a large mixing bowl, whisk egg yolks, ricotta cheese, sugar, flour and lemon zest. In another bowl, whip egg whites with a mixer until glossy peaks form. Stir about one-quarter of the whites into the ricotta mixture, then fold in the remaining whites gently. Melt butter in pan over medium heat, drop batter on using small ladle or large spoon. I used a ¼-cup (50-ml) measure.) Flatten slightly, then let cook for about two minutes per side until lightly browned. Top with macerated strawberries.